Year 2002, in Guwahati – I was about to complete my Bachelors degree in a year’s time. I was very happy, not because I could now go out of town for my higher studies, but because I could now “earn”, not for myself alone, but for my family, comprising my mother and sisters. I couldn’t wait. I started my job hunt. What was my career choice? Did I have a choice anyway? I asked my friend, Shekhar, to make a Bio-data for me (this is how we referred to a resume’ that time). It was a “bio-data” without any work experience. The only thing that I had highlighted was my pride of being a BA final year student of Cotton College – the Oxford of the North-East India. I was sure that employers would hire me seeing this. I clearly remember going to a Jet Airways ticketing agency and giving my resume. That time, I had no idea how and where a resume should be forwarded. I was not aware of the concept of HR. The lady in uniform, who received my resume with utter confusion and irritation on her face, told me: Thank you for this. I shall give it to my supervisor. She took the piece of paper from my hand and dumped it on a table that lay beside her. I still thought: I may get a ground job with Jet Airways. I knew English; I shall graduate soon! Then, why not! Days passed by, then months, but I never got any interview call. A year later, I started tuition classes and earned money for our daily bread. It was time to pick a regular source of income. Tuitions were erratic. I HAD to choose a career, which in India is the last choice of every individual who can’t afford to study in a B-school, an engineering or medical college for that matter. I chose teaching. In February 2003, I got my first job in a public school, as a Kindergarten teacher. I was appointed on the condition that I shall be confirmed only if I could show my degree. Then the great day was here. It was the BA finals result day. The graduation result sheet was in my hand; I had topped in my class and stood seventh in the entire university. It was a day of great happiness. I knew, my life would settle down soon. I hated to teach ABC to the kindergarten kids; Very often, I lost patience. Mom said: Endure!! Dream big. I took her words very seriously, and started dreaming of being an IAS officer – started preparing for the Prelims. Despite a year’s tough hard work, I failed. For the first time, I lost hope – I gave up. I cried bitterly. I thought: What could I do to do something BIG in life? I got no answer. I made my heart believe: Teaching is your career. Mom said: Do best and be your best “wherever” you are, and “whatever” you do. Those words remained stamped on my mind. I started afresh! Taught with all my heart – got a promotion to the high school and started teaching my favorite subject – Geography to the tenth standard. I loved every day in school – teaching, playing, laughing, dancing, and singing with grown up children. Many times, I became their problem solver – a teenage guide – a psychologist – and at times a friend and a parent. I enjoyed these multiple roles. Teaching was now in my blood. In the year 2007, destiny brought me to Delhi. I came here with the aspiration to become a teacher in a reputed public school. But an unplanned meeting with my mentor, who was then heading the online team of a newly launched English news channel, turned my destiny forever. He offered me a job in the online team. I was scared, nervous, and unsure. I didn’t know how I fitted into that role. But, I accepted the offer. In other words, I plunged into a career that I never knew or even dreamt I could earn. Each day was a hard learning. I rose in my career ladder not step-by-step, but inch-by-inch, slow as a snail. I learnt from people who were younger in age and career. I learnt whatever they taught – I was growing. After that, there was no turning back. I kept forging ahead. I believed in one thumb rule: Learn each day – apply your learning in your work and DREAM BIG. In the year 2011, I earned a job with the world’s most prestigious consulting firm – Deloitte. When I look back, I realize how tough it was to get here, for a small-town school teacher, with no degrees in Business. No doubt, it was a journey worth cherishing. In August 2012, I won an intra-firm blogging contest and earned the prestige of representing the firm as a Brand Ambassador at the London Games 2012. When I took a seat in a Jet Airways flight that would take me to Heathrow (London), I closed my eyes for a while. I recalled that day, ten years ago, when I went desperately looking for a job at a Jet Airways ticketing counter. I smiled in my heart. I took a deep breath and thanked my destiny or God, whatever it is, for being so kind to me. Tomorrow, February 17, 2013, I shall complete 10 years of an enriching journey in career. I feel I have achieved, unknowingly, so much. I have learnt so much – i have tasted failure and success, both. Ten years hence, I may or may not be the CEO of a firm. But, I can say one thing for sure that I will be a more experienced human being who will proudly tell her children that giving up is the end of life. One, who forges forward with sincerity and focus, never loses any battle. Even if he loses for the world, he will be able to say with pride, and with no pain in heart: At least I fought! At least I tried! And, so I am happy and content. This will make a human being a true winner. Sometimes I thought it was love, sometimes I thought “no”. You met me in the lows of life. Like a breeze in the summer of my life. But your smile felt instantly mine. Whenever you met me, I felt like a parched piece of soil meeting a rain drop. I sat watching u..and asking myself repeatedly: is it just he and I, or an unfinished love story from my previous birth? Some unfinished love stories are more beautiful and accomplishing than the finished ones. There are some life lessons that children should be taught early on so that they do not encounter challenges that look insurmountable. I have decided to do the same. Here are a few things I will teach my son. Life is not rosy: When we, as parents, tell our kids that life is too perfect like a picture, we are creating an illusion for them that will fizzle out one day. That day will be painful. To avoid that, why not give them the real picture? Life is beautiful, but harsh at times. You need to accept life with all it’s imperfections. It is ‘OKAY’ to face hardships – they are part of life, just as those blessings that already exist or may come to our life. You cannot win ‘all the time’: Yes, it is the fact of life. In the various games and tests of life, we cannot win all the time. Losing and winning are parts of life. Striving to win is most important. The outcome isn’t. Why? Because the passion to strive and attempt to do better each time is more important. If you strive, you may win. And if you don’t strive, you cannot. Learning from victory and defeats is an equally important thing. When you win, that doesn’t guarantee recurrent victories. Losing at the same time, doesn’t warrant repeated failures! After every win, instead of feeling overconfident, it is important to revisit your strategy and assess ‘what could have been done better?’ Similarly, after every defeat or failure, it is mandatory to scrutinize yourself. None can be a better judge to your performance than yourself. Condition is: Be honest! Compete with yourself: Each one of us is unique, with unique qualities, and hence, have unique goals in life – personal and professional. There is no question of comparison. Yes, you may aspire to be “like” someone, but certainly not him/her! Each one of us come from different family backgrounds, upbringing, needs and dreams. Then why compare yourself with someone? What gives me the deepest satisfaction is my own learning curve; my own growth curve. When I look back on my professional and personal journey, I feel totally victorious. I have earned so much for myself. Whenever you feel deadlocked in this competitive rat marathon, ask yourself how well you have fared in the past months or years? Have you overcome at least one of your weaknesses? If the answer is a power ‘yes’, bring a broad smile onto your face, get a cup of nice coffee, and just feel accomplished. Competing with others is the worst thing you can do to yourself. Reason? You can’t measure how much you have grown as an individual by comparing yourself with others. Never give up: Life hurls unexpected challenges and hurdles on our way. There is none on this planet earth who lives a life free of challenges. Encountering hardships and challenges is THAT common. The biggest defeat is not a failure, but the tendency to give up mid-way because someone thinks you are not able to make it. In any battle of life, the course of events can never define your victory or defeat. What matters is how hard, strategically and courageously you fought! A courageous battle may or may not bring a victory, but it will surely make you a more experienced and a stronger individual. What is bigger and more definitive than this? She fell on the ground to walk again. She wiped off her tears to race again. She kissed it back with a promise to win. And vented her fears to the tall trees. The Power in the Words: You CAN’T do it! Have you ever been told by someone that you can’t do it? If you have, I am sure you will connect with what you are going to read in the next few minutes. Year 2007: My professional life saw a huge transition; I moved from teaching to journalism, with no understanding of how media industry works. I felt like a tiny fish in an ocean. Even personally, it was a huge change because I had, for the first time, stepped out of my comfort zone (my home town, my home). I met new people in a new city. I missed my home so badly. I missed the classroom where I taught young students. In this new organization, I was the student, attending trainings on digital editing, camera, newsroom computer system etc. Though not required for my role, I was advised that I should sit in. In one such sessions, the trainer (someone who had spent more than 15 years in TV industry), asked each one in the class: Where have you come from? He meant, which news channel or media house have you come from. As each one in the room, called out BIG names, I will be honest, I felt embarrassed to say: I was a teacher. Finally, when I said this, the trainer asked to reassure: Pardon me? Repeat yourself? I repeated myself: I was a teacher. He looked at me with disgust, with his brows wrinkled. He said: What are you doing here? Who hired you? You can’t survive HERE. You will have to go back from where you came. YOU CAN’T DO IT. There was death silence in the room. My colleagues sat with their eyes looking at each other. Some had their eyes gazing the floor. Clearly, they didn’t anticipate such harsh discouraging words from someone senior. I sat there, pulling a smile onto my face with huge difficulty, while my heart wept. I had never learnt to reply back my seniors. Then, he moved to the person sitting next to me. Soon the training started, and soon it ended and the class dispersed. I rushed to the restroom. Cried my heart out. Cried because I felt I lost the battle even before it started. I felt like a loser. After 15 minutes, I stepped out of the restroom and went to my work station. There, my Manager was waiting to speak with me on some matter. He realized I was sad. He asked me to pull a chair, sit, and relax. Then, very patiently, heard the whole story. I can’t forget his words and his smiling face. What he said, changed my life FOREVER. He said: Monika, this is a big city, and bigger is the competition in this industry. You will find many, many more people like ‘him’ who will talk without thinking. In the same industry, you will ‘also’ find people like your team mates, your peers and seniors. They are there to help you scale up your skills and teach you new ones. They are your real mentors, and your workstation is your classroom. Treat this opportunity as one in a million and make the best out of it. Learn ‘on the job’ with enthusiasm. Do not let these words bog you down. Rather, treat them as ‘power words’ that propel the best out of you. Wipe your tears, and get to work with a renewed vigour. Those words filled my heart with hope, and my mind with a determination to prove myself a great fit for the role. My team mates will vouch for this. I learned each day from them, and gave my best shot at work. Within a year, I was writing features for the website, interviewing celebrities, diplomats and the like. I was efficiently monitoring news, coordinating with journalists, and updating the website. I was also blogging at the same time. I continued polishing my skills and working hard on my development areas. I received appreciation from my Manager, team mates and seniors. They were so happy to see me grow. I thank my stars for finding such great people at work. 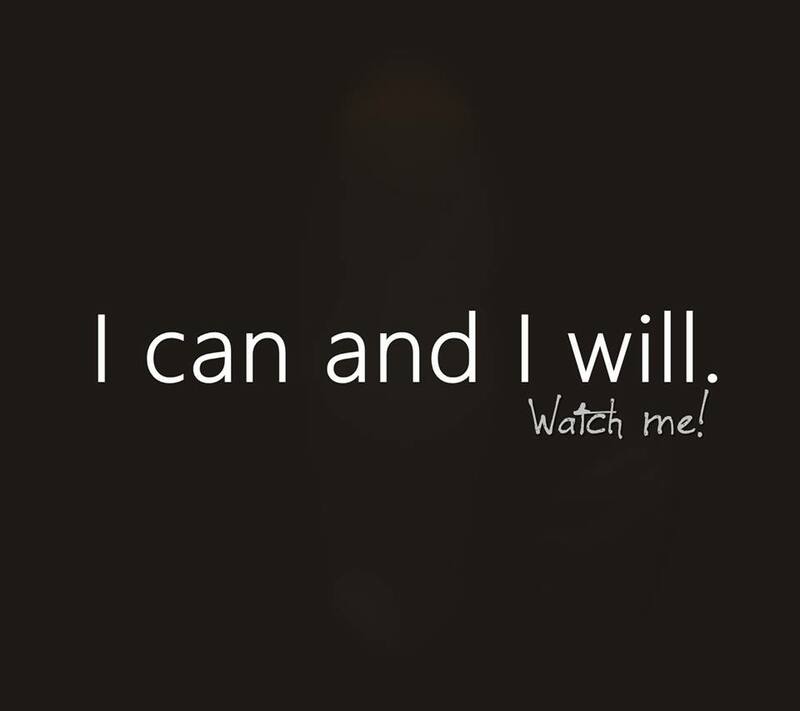 People who said, you CAN’T do it, and people who confidently said: You CAN! One THAT moment is THIS. It will vanish FOREVER in the next moment. I was looking at the Facebook page of a friend who lost her child in a car accident recently. The child, who had not yet seen the fifth seasons of her life, looked so ‘live’ in those pictures of her albums. She smiled, giggled, clinging to her mother’s chest, with that little toy she carried everywhere. It seemed as if she will spring out of that photo any moment. My heart, a mother’s heart, ripped apart, the moment I realized that she is no more. She is not alive. I can’t imagine what her mother goes through each day, each moment, each second, with each breath. For a mother, her baby is the biggest reason to live. How is she living? How would be the burden to wake up without her child’s fragrance in the bed, without ‘her’ by her side? I shudder to think. Tears well up in my eyes; there is a lump in my throat. I try to clear it, but it comes back. Honestly, that feeling of helplessness engulfs my mind and my broken heart. I can’t quote figures and statistics, but I know for sure, in India, road accidents are on rise. Drunken driving, careless driving, carefree driving is growing. Lately, we have read many such news in the media. Should I name them here? No use. As helpless or hopeless I may sound, I fear this shall go on. Reasons are not unknown to you. Call it the need to strengthen the laws, or whatever. What can be done at lease is to make the roads safer! HOW? If the ruling central government, in collaboration with the state governments, and the BIG NAMES in medical industry, like MAX, APOLLO, FORTIS, and the like, or even CORPORATES come together with a master plan, we can have emergency response mechanism in place. One accident, one call by any passer-by (witness), and these emergency service points, set up on the highways, come to rescue. This way, unfortunate ones who face accidents on highways, can get quick relief. As an ‘ordinary citizen’, I don’t know what goes into making this mechanism robust and useful. I can ONLY suggest because I feel this could happen to anyone – a common man or a law maker! Rajesh Pilot is an example, who despite being a senior politician, had to lose his life in a tragic road accident. The recent road accident where a little girl died when Hema Malini’s car hit the car the victim was travelling in. Besides promoting safe driving, we MUST also propose safer roads with great emergency response mechanisms in place. As I write this, I hope my readers, will come up with their thoughts on this – any feedback, suggestion, ‘just thoughts’, anything! I hope, you will share it far and wide. A BIG thank you from a mother, for feeling the pain of those who lost their loved ones in road accidents. There are times in life, when people stop believing in what you say. That is mainly because you may have demonstrated lack of conviction or confidence. It is heartbreaking. But, at the same time, it gives you a ‘push’. THAT is the moment when your heart and mind tells you: Show them you can! One thing you should know about me is that I love Rains..